With the arrival of summer hibiscus of all types are currently showing off their large, flamboyant flowers. Throughout the world, there are 232 species not including the many hybrids of this versatile plant. In addition to being used as an ornamental in both tropical and temperate landscapes, hibiscus is used for making paper, as a beverage, for medicinal purposes, as a food, and even incorporated in cultural ceremonies. In this region, depending on the species, it a tropical plant, a perennial and a shrub. Let’s take a closer look at several of the ornamental species of this fascinating and attractive genus hibiscus. When you think of hibiscus, you probably think of the bright yellows, reds, pinks, and orange flowers of tropical hibiscus. These types of hibiscus thrive in full sun and are magnets for hummingbirds. Tropical hibiscus will not survive our cold winter temperatures but lucky for us there are hardy varieties of hibiscus. Perennial hibiscus, commonly called Rose Mallow, are winter hardy and there are several varieties native to North America. In your landscape perennial hibiscus can be used as a focal point in the garden or planted at the edge of a pond or wet area. They prefer full sun to part shade and love moist soils high in organic matter. Hardy hibiscus also attracts hummingbirds and are deer resistant. For the last decade, plant breeders have introduced many new varieties hybridized to enhance desirable attributes such as flower size and color, leaf shape and color and compactness. Flowers of some hybrids are as large as dinner plates, range in color from white, pink, burgundy and bi-color and bloom from July through the summer. Leaf color and shape has not escaped breeders’ attention. Intense foliage colors and interesting shapes have added to their attractiveness. Perennial hibiscus dies back to their roots in winter and is late to show signs of life in the spring. Don’t be surprised if there are no signs of life until as late as June. 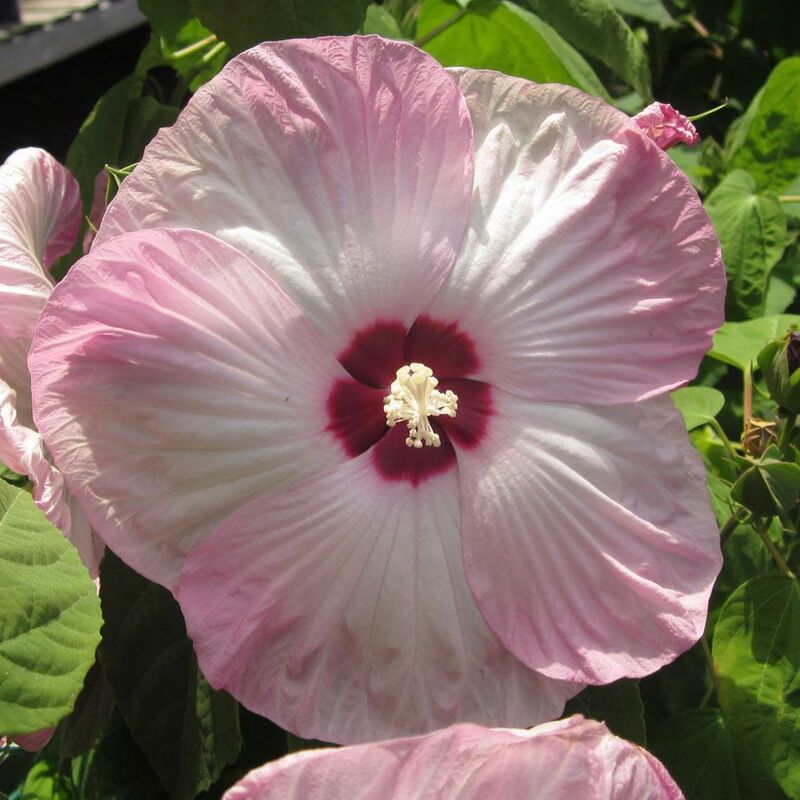 We love the Hibiscus ‘Luna Series’ for their compact habit and 8-10 inch red, pink, white, or bi-color blooms. They are perfect for your garden or even a container. Some other interesting perennial hybrids include dark-red flowered ‘Heartthrob’, rose-pink with red-eye ‘Fantasia’, and ‘Midnight Marvel’ with dark, maple-like foliage and scarlet flowers. 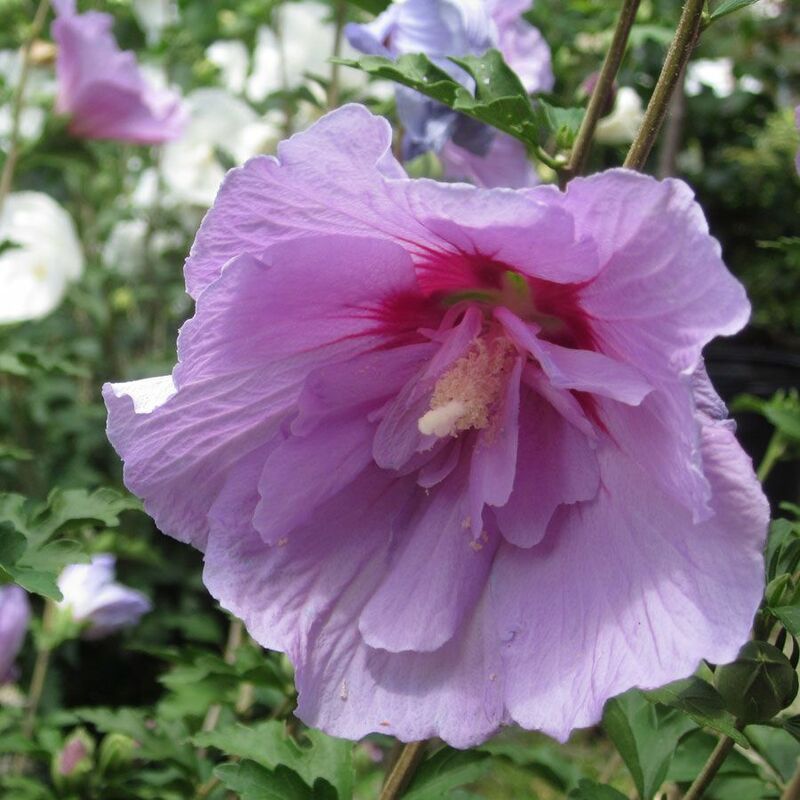 There’s also Hibiscus syriacus, more commonly known as Rose of Sharon. It’s a deciduous shrub able to tolerate Chicagoland winters. Varieties feature large trumpet-shaped single and semi-double flowers in a variety of colors including blue, lavender, white and pink. Although individual flowers last only a few days, they produce lots of flowers throughout July, August and into September. Like its perennial counterpart, H. syriacus is late to leaf out in the spring. Shrubs can be pruned to tree form if desired and shaped in the spring to control size. Seed pods should be removed after blooming to eliminate reseeding. Depending on the variety this hibiscus grows six to ten feet high and nearly as wide. Rose of Sharon attracts butterflies and hummingbirds. Fun fact: H. syriacus is the national plant of South Korea.